Glowing hair gel is a unique product developed by Noxton Company that will be equally favorable to men and women. The main idea of the self-luminous styling gel is not just to help you make a hairstyle you want and to secure it, but also to get a stylish and trendy self-glow effect in the dark. At the same time you won't need any further instructions on how to style your hair using glowing gel – the product is no different from the ordinary and familiar to you styling gel, so you won't have to figure out how to use the Glow in the Dark Gel. Feel free to experiment in order to get the result you want: you can either cover your hair with a luminous gel completely, so that the self-glow effect will definitely set you apart from others, or mix an ordinary styling gel with a glowing one from Noxton, so that due to luminescence effect, you will become able to emphasize certain elements of your hairstyle to stand out from the crowd. We have received a lot of feedback on luminous hair gel, while 100% of respondents reported its stunning effect. It is worth to note that self-luminous hair gel is totally harmless, easy to rinse, hypoallergenic and has no contraindications to use. Its only difference from the ordinary one is the afterglow effect. Glow duration depends on time and intensity of the charge – in other words, if you've been in a well-lit hall for 10 minutes and then moved to less illuminated place - your hair will start to glow. What is more, when the gel is being exposed to neon lamps, that are so wide spread at discos and night clubs, its glow intensity will significantly increase, that means by using luminous hair gel from Noxton you will become a queen or a king of any party! You can buy a hair gel with an afterglow effect here, at Noxton, by making an order at «Contact Us» page. At that page you can also ask us any question you want related to our product. And remember that Glow in the Dark Hair Gel would help you to always be in the limelight. Ingredients: Luminescent powder is being added to strong and super strong hair gel, wet look hair gel and others. Purpose of glowing hair gel: Used to make unique hairstyles and to emphasize certain locks or a hairstyle contour. Is a novelty among modern cosmetics for hair styling. Properties of self-glowing hair gel: Locks glow in the dark by themselves. Brightest glow can be seen for 30-60 minutes after the charge, but if you'll use a more powerful source of light (like a neon lamp) - self-glow effect will be visible for hours on end. Recommendations: Use the luminous hair gel to make hairstyles for club parties, trendy hangouts and youth discos. Glow colors: Light green or light blue. Storage and use of luminous styling gel: Restrictions for gel apply here. You well be well distinguishable among others when moving from a bright place to a darker one. Self-luminous gel is not seen on hair in a well-lit place. When you use a powerful source of light to charge the luminous hair gel it starts to glow so bright that your face becomes perfectly visible. 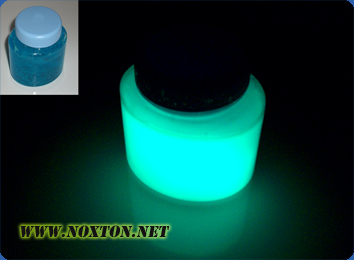 Noxton Technologies informs its customers that it is really simple to make a hair gel with a glow effect yourself at home. In order to do that, just add some Glow in the Dark Powder TAT 33 of the desired color to the clear gel you like. After mixing the substances you'll get a glowing hair gel that will give the afterglow effect. 21st century technologies are now closer than ever. We would be happy to see new representative offices specialized in luminous products production. In that case, our Company will provide you with all the necessary technical support and advices related to usage of the glowing compounds. Glow in the Dark Gel goes well together with other luminescent products from Noxton, like Glow in the Dark Sneakers or self-luminous flowers. To check out the prices for glowing wet look hair gel from Noxton, please proceed to "Price list" page.